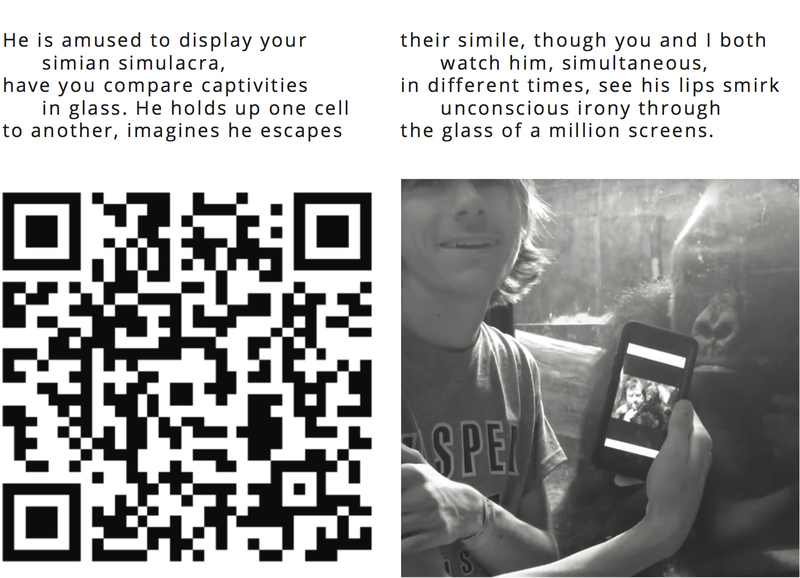 This is the third poem of Conversations with Viral Media, a series of publicly posted broadsheets that contain poems written in response to viral video, stills from those videos, and QR codes linking to the videos themselves. They are intended to comment on the way that viral videos can function as symptoms of our cultural dysfunction. They will be released periodically until I get bored. Links to all of the poems with their videos can be found on the Conversations with Viral Media page. 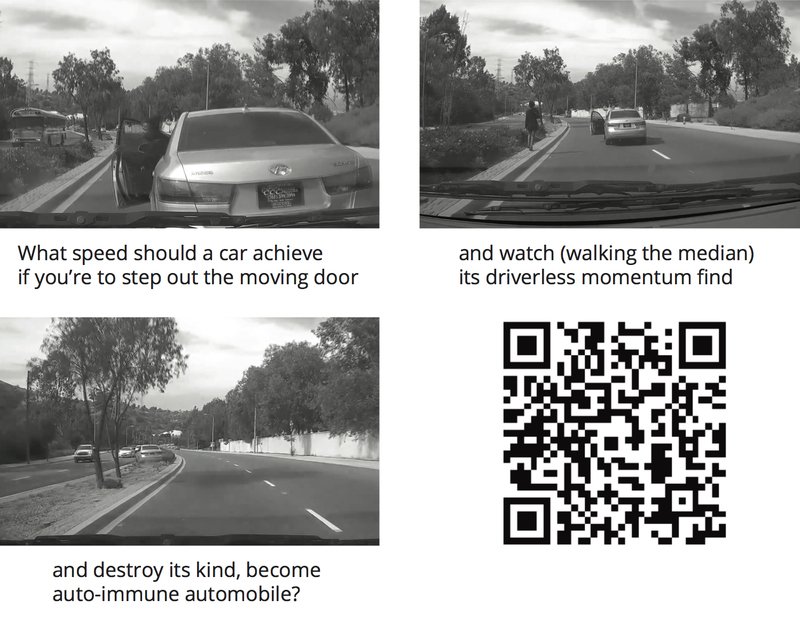 This is the second poem of Conversations with Viral Media, a series of publicly posted broadsheets that contain poems written in response to viral video, stills from those videos, and QR codes linking to the videos themselves. They are intended to comment on the way that viral videos can function as symptoms of our cultural dysfunction. They will be released periodically until I get bored. Links to all of the poems with their videos can be found on the Conversations with Viral Media page. 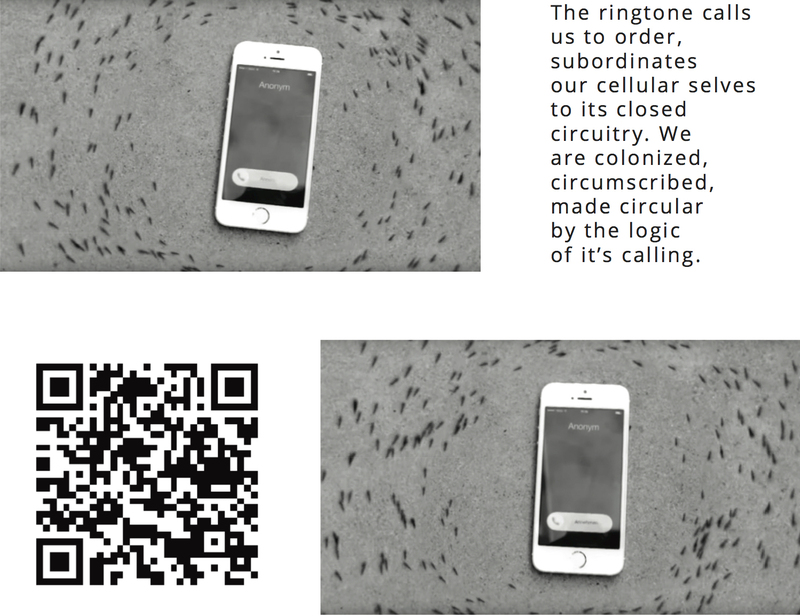 This is the first poem of Conversations with Viral Media, a series of publicly posted broadsheets that contain poems written in response to viral video, stills from those videos, and QR codes linking to the videos themselves. They are intended to comment on the way that viral videos can function as symptoms of our cultural dysfunction. They will be released periodically until I get bored. Links to all of the poems with their videos can be found on the Conversations with Viral Media page. I don’t often write about video gaming, first because I haven’t had much time for games since I was a teen, and second because even then I only liked certain kinds of games. Even so, I’ve always been fascinated by the possibilities that gaming has for producing what I’ll call “open-worlds”, and some of what I saw from this year’s E3 conference started me thinking about how these open-worlds might be better accomplished. I should probably start with some context. The vast majority of games bore me, always have. Sports games are the worst, and first-person shooters are close behind, but almost all games feel to me like little more than combinations of complex hand-eye co-ordination endlessly repeated. I hear all the time how video games are the medium that will tell this generation’s stories, but if so, this generation’s stories are largely pretty sad (A revenge story? Has it been done?). At best, their used as a veneer to justify massive and brutal violence. Often they don’t even manage that. I hear also how video games create immersive worlds for players to explore and fuel their imagination, but again, these imaginative worlds are usually little more than pretty settings for whatever carnage that forms the game’s central focus. Newer and better generations of technology improve the textures, the lighting, the AI, almost everything but the world in which the game takes place, which remains largely neglected. That isn’t to say that I hated all games as a kid. I enjoyed playing games like Mario Kart with my brothers, and there were two games that made me realize what games might actually achieve if they were made by people who wanted the same things as I did. The ability to accomplish tasks in a non-linear way in The Legend of Zelda: Ocarina of Time showed me a first glimpse of what an open-world might be (even if its dungeons and its story were still basically linear), and Myst showed me the kind of story and mystery and originality that might make an open-world truly worth exploring. I played both those games and their sequels to death, though always feeling like I wanted to combine them, to play in a truly open-world, with all the elements of story and wonder that this phrase means for me. Then, in 2002, Morrowind was released. Now, to be clear, first-person choppers don’t rank much higher in my estimation than first-person shooters, but when I saw the world of Morrowind I knew I had to play it. The sheer freedom of the game play and the complexity of the intermingling storylines and the novelty of the world (which the Elder Scrolls series has yet to replicate), came the closest of any game to the kind of open-world that I had imagined. In fact, for the first few days I owned the game, I turned on god-mode and just wandered around the world looking at things, before I went back and played it through. It’s still one of the few games (despite its awkward combat and its many bugs) that produced genuine moments of wonder in me. Just as important, Bethesda Softworks, the creator of the Morrowind, included a constructor set with the game that allowed gamers to mod the entire world, adding something as simple as a new pair of shoes or as complex as a whole new island, complete with stories and dungeons and monsters. In one case, a group of modders used the tool to try and recreate a whole different world distinct from the game, essentially taking on the task of a game studio as an amateur community. This constructor set pushed my conception of open-worlds to include the possibility of changing those worlds, to be involved in their creation, a possibility that has proven its attraction through recent titles like Minecraft. I realized that I didn’t just want to explore beautiful worlds and complex stories, I wanted tools to change and recreate them. In this respect, many recent games, even ones that are otherwise open (the other Elder Scrolls titles, Red Dead Redemption, Grand Theft Auto, Witcher, and so forth), or that have attempted more sophisticated story (The Last of Us gave me chills with the giraffe scene), or that have focused on experiential worlds (Journey is a personal favourite, and Elegy for a Dead World is an interesting experiment with users contributing to story), have done little to further the capacity of gamers to participate in the making of their own worlds. Which brings us at last to this year’s E3 conference and, in particular, to Bethesda’s presentations. Among Bethesda’s various titles they gave a lengthy introduction to DOOM (formerly Doom 4), which is the prototypical mindless shooter (Wow, look how realistic the chainsaw animations are! ), so much so that I almost didn’t finish watching the presentation. However, Bethesda then went on to announce the inclusion of Doom SnapMap, which offers gamers the tools to make incredibly complex game levels. The levels being created still interest me hardly at all, but the tool itself is amazing. I would pay for it on its own if it were expanded to include other elements beyond those from the game. The ability to create interior spaces quickly and easily, to furnish them, and to create scripted interactions between NPCs offers gamers massive opportunities to create, not just more game levels, but also complex machinima, custom multiplayer story, and who knows what else. Imagine being able to construct a story in a game world and then inviting your friends to join you in it, to watch it play out around you, to participate in it, even to experiment with how your interaction changes it. Imagine this tool being available for your favourite game, or your favourite movie, or your favourite book for that matter. What could you do with it? What would your open-world become? Another of Bethesda’s E3 games, Fallout 4, provided yet another possibility for building open-worlds. Fallout 3, the first of the series to be published by Bethesda, was already pretty open in its story and its structure, a prototypical sandbox game that essentially transported the experience of the Elder Scrolls series into the post-apocalyptic future with a genre-saving dash of 50’s retro humour. It was easily good enough to amuse me (though the New Vegas follow up content seemed sub-standard), but it didn’t offer much in the way of allowing the user to recreate the world beyond limited customization of your home. Fallout 4, however, more than just a re-hash of its predecessor on a new generation of console, includes two remarkable features. First, some structures in the game can be torn apart and reutilized to make new structures, including houses, electrical systems, defensive positions and so forth. Second, all of the items in the world (and Bethesda is famous for letting players interact with all of the ridiculous numbers of mostly useless items that it scatters throughout its worlds), can be used for their component parts in order to create new weapons and other items. These two modes of engaging with the game allow users to customize it in interesting ways, making it more truly an open-world. Both of these functions have appeared in other games, of course. Bethesda is not breaking entirely new ground here, but in the context of the SnapMap presentation, it struck me how this form of game interaction has so many possibilities beyond just building houses and customizing weapons. What if the expanded SnapMap open-worlds we were imagining also integrated the capacity to alter elements in-world, to take what the designer had created and recreate it? What if the open-worlds that we imagined were always susceptible to other players or even NPC’s using them in ways we didn’t expect? What if the materials of our open-worlds became available to us in ways that mimic real worlds? Again, what could you create with tools like that? Given the opportunity to become the creator of an open and interactable world, what stories would you tell? As I first glimpsed in the Morrowind Constructor Set, it’s this kind of freedom that I really want in a game. I want to do more than just wander through a designer’s imagination (which is usually limited by catering to certain kinds of gamers). I want to change, recreate, and experiment with the game. In the end, I want a game that is simply the tools for its own creation. I was reading boingboing today and followed a link to an article by Elizabeth Minkel in the NewStatesman that compares the media response to different sorts of fandom. Minkel notes that the emotional reaction from young girls to Zayn Malik leaving One Direction was roundly mocked, but that a similarly emotional reaction from middle-aged men to Jeremy Clarkson leaving Top Gear was mostly met with sympathy. She argues that this disparity in treatment of the two sets of fans is directly tied to gender, a conclusion that I think is accurate (although I would add that it is probably also related to age). To this extent, I agree with Minkel. The way the media responded to these two situations reveals, once again, that our culture still has a profound gender-bias. I disagree, however, with the underlying implication that we should treat Zayn Milik’s fans with the same sympathy as Jeremy Clarkson’s. Quite the opposite. We should treat them both with the same apprehension and alarm. We need to realize, not with mockery but with concern, that it is in fact ridiculous for young girls to invest themselves so deeply in the members of a boy band, and that it is just as ridiculous for middle-aged men to invest themselves so deeply in the host of a car show. The strange bit isn’t that we mock Zayn Malik’s fans. The strange bit is that we don’t mock Jeremy Clarkson’s fans just as much, or even more, considering that they might be expected to have matured a little by their age. The problem isn’t that we criticize the fans of boy bands. The problem is that we don’t equally criticize fans of other actors, musicians, athletes, and every other kind of celebrity that gets trotted out across our media consciousness. The fact that grown men pay huge amounts of money to gather in the thousands at sporting events, drink too much, paint their naked bellies, scream at the top of their lungs, and sometimes do violence to each other is without doubt bizarre in the extreme. The fact that young girls exhibit similar behaviours at pop concerts is equally bizarre. The obvious gender-bias in their media portrayal should not obscure the fact that both are deeply problematic symptoms of a culture that has been distracted from anything resembling a significant issue by the worship of celebrities. Now, I have no interest in cars. I don’t even own one. I’ve never seen an episode of Top Gear, and I wouldn’t recognize Jeremy Clarkson if he was right next to me having a fit about his lunch. But I do like to play sports, even watch them occasionally. I also like music of many different kinds (even if One Direction isn’t one of those kinds). Despite my interest in these things, however, I can’t imagine being invested enough in their celebrity culture to be considered a fan. I might have an opinion as to the skill of these celebrities (I might think that Daniel Day Lewis is an excellent actor, for example, and that Tosin Abasi is an excellent guitarist, and that Tim Duncan is an excellent basketball player), but I have nothing invested in them. Their retirements, even their deaths, would have almost no effect on my life. And they shouldn’t. My time and my energy and my money and my passion need to be invested in the real people around me, in the real lives that they live, in the real issues that they face. Think of what we could accomplish with even a fraction of the resources that we dedicate to our celebrity culture. Think of the changes that could be made to real lives if we weren’t so distracted by our ridiculous fandoms. Religion is no longer the opiate of the masses. Sports and entertainment now play that role, and whether it’s young girls crying about One Direction or middle-aged men crying about Top Gear, we have to stop pretending that any of these obsessions are worthy of sympathy.